Could Earlier Foreclosure Notices Help Borrowers Save Their Homes? 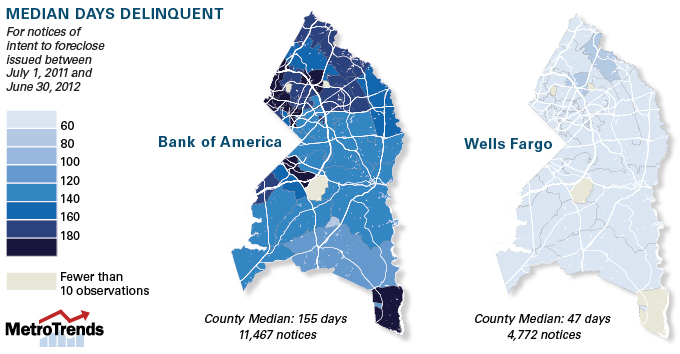 As part of our ongoing tracking of the foreclosure crisis in the Washington, D.C., region, NeighborhoodInfo DC examined Notice of Intent to Foreclose (NOI) filings in Prince George’s County, MD, from July 2011 through June 2012. Among other findings, our analysis revealed stark differences in when mortgage servicers —banks that collect monthly mortgage payments, administer the loan, and handle foreclosures—issue NOIs. These differences in servicer behavior could have profound implications for troubled homeowners and whether they can become current again on their mortgages and keep their homes. In Maryland, mortgage servicers must file an NOI at least 45 days before initiating a foreclosure action in court. Filing an NOI triggers a number of subsequent steps that must be completed before a foreclosure sale can take place, including allowing the borrower to request mediation with the servicer within 25 days to negotiate a loan modification, short sale, or some other solution. Bank of America and Wells Fargo are at opposite ends of the spectrum in the timing of their NOI filings. The median homeowner with mortgages serviced by Wells Fargo received NOIs much sooner, when they were less than two months delinquent in their payments, while Bank of America borrowers did not receive NOIs until they were nearly five months behind on payments. As a result, the median delinquent Bank of America borrower owed $9,300 on his mortgage at the time the NOI was issued, compared with $4,400 for the median Wells Fargo borrower. The difference in the amount owed could make it much harder for homeowners to catch up on payments and might result in many more foreclosed properties. But does receiving an NOI sooner make it less likely that a homeowner will end up at a foreclosure sale? Our current data don’t tell us this because we cannot link NOIs to foreclosure sales nor can we account for other borrower or loan characteristics that might affect outcomes. While an NOI puts homeowners on a path that could result in losing their home, receiving a timelier NOI might motivate homeowners to seek help sooner, especially since the first page of the notice explains how to find housing counseling services. Research has shown that borrowers who seek solutions earlier, before they fall too far behind, are more likely to have successful outcomes. Until we have better data, we are left wondering: Why do some servicers take longer than others to issue NOIs and what impact does that have on homeowners? Want to see how the top six servicers—Bank of America, Wells Fargo, JPMorgan Chase, Citi, IndyMac Bank, and GMAC—compare? View Urban Institute maps of the foreclosure indicators by servicers. could undeniably be one of the greatest in its niche.